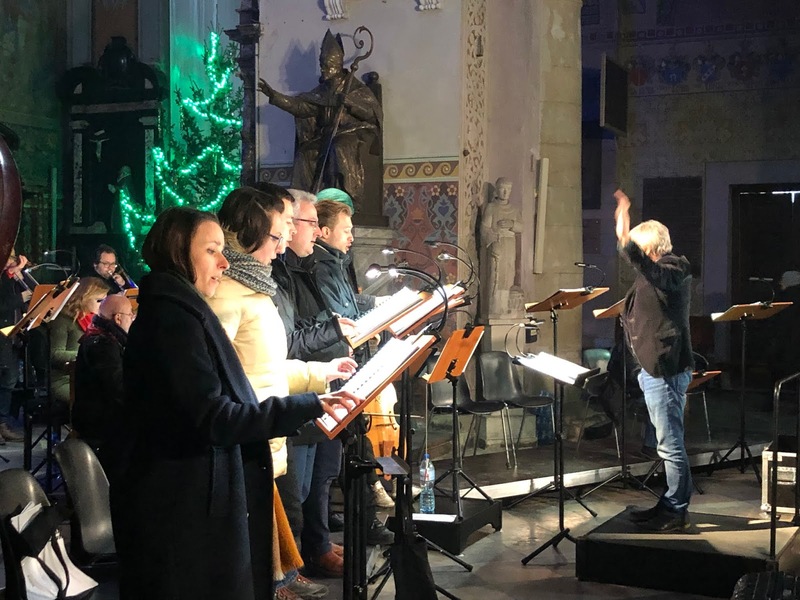 Andrzej Kosendiak and the Wrocław Baroque Ensemble performed music by Marcin Mielczewski in two cities alongside the Vistula river in central Poland. 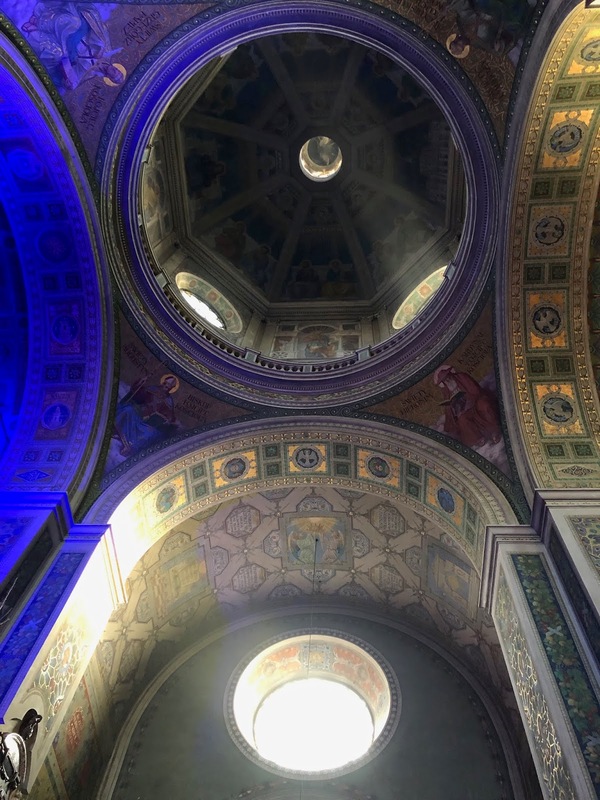 The first concert took place in Płock Cathedral (the Bazylika Katedralna Wniebowzięcia Najświętszej Maryi Panny) on Saturday 2nd February 2019, and the second concert took place in the Great Hall of the Royal Castle in Warsaw on Sunday 3rd February 2019. The all-Mielczewski programme culminated with the Vesperae Dominicales, utilising my arrangement with reconstructed cornett and sackbutt parts. Playing the Vesperae Dominicales in Warsaw and Płock had historical significance and precedence. Marcin Mielczewski had worked at the Royal Chapel in Warsaw from 1632 onwards under Władisław IV. Mielczewski became the Kapellmeister in the service of the King’s younger brother Prince Charles Ferdinand Vasa who was the bishop of Wrocław and Płock. Bishop Vasa therefore provides the link between Warsaw, Płock and Wrocław. Mielczewski’s Wrocław version of the Vesperae Dominicales was specially augmented with Renaissance trombone and cornett parts. Andrzej Kosendiak invited me to make a new version in 2015 with reconstructions of these parts, for a performance and recording in Wrocław. I arranged a delegated instrumentation between the violin and cornetto parts, and included reconstructed trombone parts for movements I to IV (N.B. ‘V - Magnificat’ has surviving original trombone parts). I enjoyed playing with the Wrocław Baroque Ensemble again after a long time away. I’d been invited to play in a few other projects in the interim since recording the Mielczewski CD but unfortunately prior engagements and diary clashes had prevented my return. It was great to see everyone again and carry on from where we left off. In the time since the Mielczewski CD, the ensemble has produced a second Mielczewski CD, called Mielczewski II. The personnel of the ensemble for this project in Płock and Warsaw represented some of the players from the first CD and others from the second CD. A few pragmatic substitutions had also been made - several of the pieces in the first half of the concert featured four trombones and so the bassoon part for the Vesperae Dominicales was played by the additional sackbutt player (Masafumi Sakamoto), in lieu of a bassoon. Masafumi also played an obligato sackbutt part, with the violinists Zbigniew Pilch and Mikołaj Zgółka, in the Canzona seconda a tre, which immediately proceeded the Sunday Vespers. I played the first cornetto part and was the only returning non-string player from the recording of the Vesperae Dominicales. We had many of the same singers and string players as before, with two additional violinists (Radosław Kamieniarz and Małgorzata Kosendiak) playing in some pieces. We had very little time to put this programme together; the first rehearsal was on the day of the first concert and many people had not played the Vesperae Dominicales before. It was by far the longest and most complex piece (in terms of time changes) in the programme. It was great to explore Płock and to meet the other trombone section (Johannes Kronfeld, Ferdinand Hendrich, Masafumi Sakamoto and Karl-Heinrich Wendorf). We travelled by coach from Płock to Warsaw in miserably bleak weather. The landscape of forests and fields was interrupted by an occasional bridge over the Vistula. There were very few people out in this weather; signs of life were apparent from the occasionally-visible chimney smoke from farmhouses appearing through the drizzle and mist. 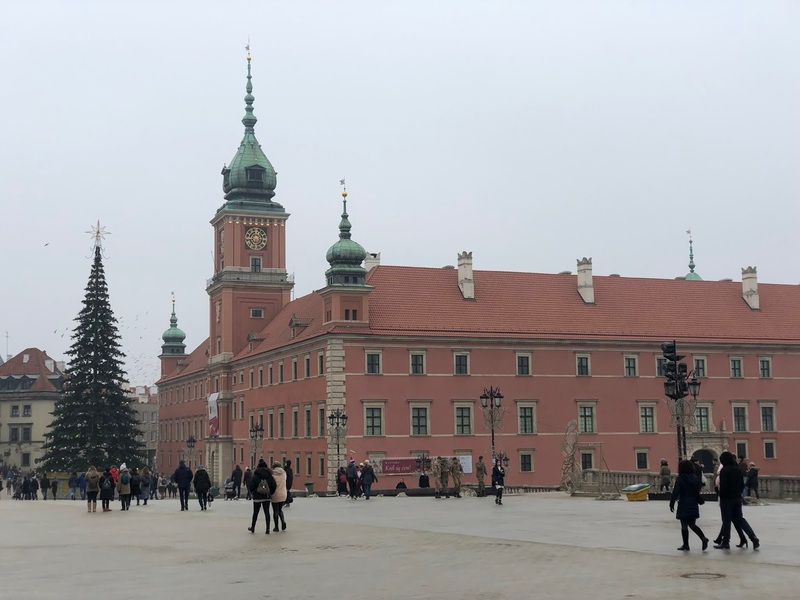 We arrived in Warsaw to clearer weather and I enjoyed wandering around this wonderful city - following my own well-trodden path from the Ibis Stare Miasto hotel, through the old square and along the Nowy Świat. I observed a few of my favourite spots and reminisced about many previous visits: trumpet section sausages in the Christmas market in the old square, ice creams with a trumpet player from Krakow on the city wall, the antique shop where I bought a Romantic trumpet by Leopold Mitsöning of Elberfeld, paying homage to the commemorative plaque of the Polish composer Stanisław Moniuszko who’s music I once recorded in Warsaw, passing the Sofitel Victoria where I stayed with the Orchestra of the Eighteenth Century for the first time, a few favourite restaurants along the Nowy Świat, the church where Chopin’s heart (preserved in Cognac) was interred, and finally a bowl of Żurek soup. I find Warsaw to be a fascinating place. I cannot help but think of the incredible damage that was done to it during the Second World War. The amazing historical restoration of the old city is remarkable. One such reconstructed building is the Royal Castle, where we performed, which was rebuilt between 1971-1984. We played in the Great Hall: a resplendent room (of modest proportions but with a good acoustic) of white, gold leaf and marble columns with fine chandeliers hung beneath an enormous ceiling fresco. 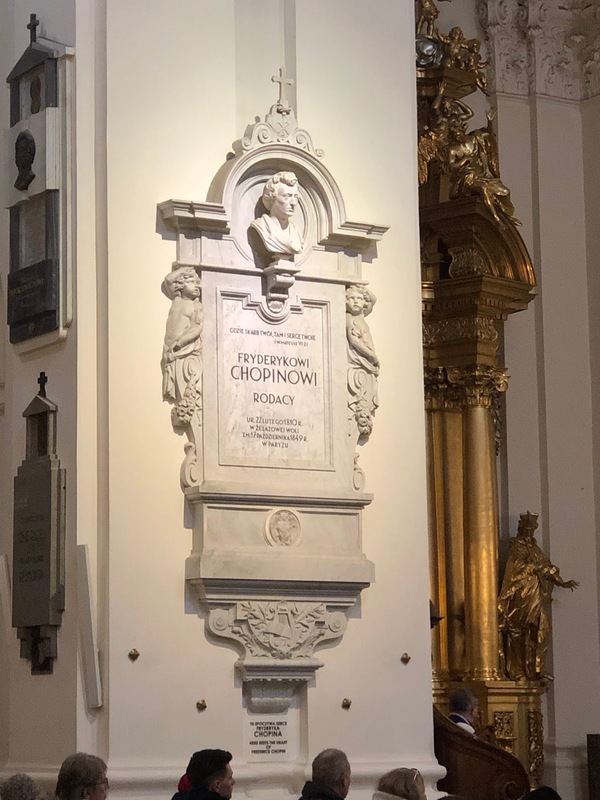 The concert in Warsaw, which took place at 6pm on Sunday 3rd February 2019, was recorded and broadcast live by Polskie Radio. A separate production team operated remote controlled video cameras from backstage; they were filming to produce a video for future release on YouTube.